Hikonyan is the mascot of Hikone. He, maybe she, is a portmanteau of Hikone and “nyan”, the onomatopoeia of a cat’s meow in Japanese. The character is utterly cute and serves as a retelling of a story of how Naotaka Ii, one of the founders of Hikone Castle, was saved by a white cat beckoning him into a temple. On that day, there was a thunderstorm in Hikone and while he was taking refuge under a tree, he was beckoned into a nearby temple by the cat. When he reached the temple, a flash of lightning struck the tree he was standing under. 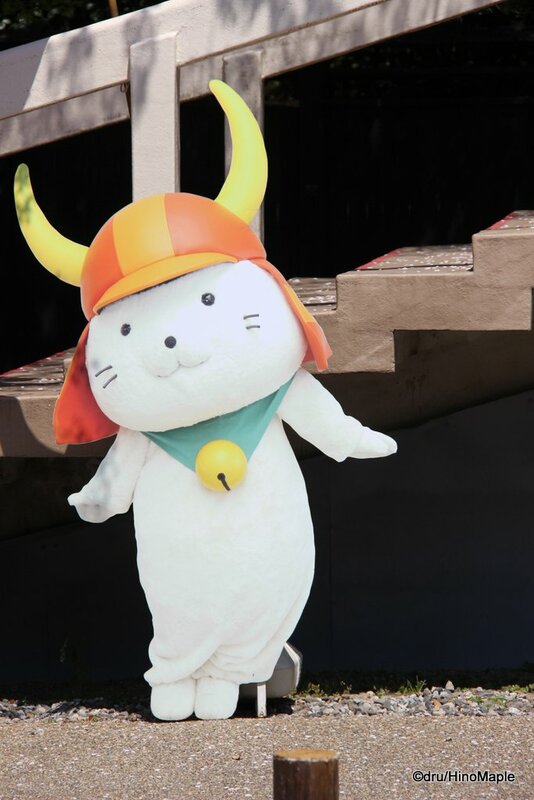 This same cat has been turned into Hikonyan, the mascot of Hikone. Hikonyan has won the coveted top character of the year in 2010, an honour that was also bestowed upon Kumamon and Funassi, characters for Kumamoto and Funabashi respectively. Many say that Hikonyan has helped save the tourism industry in the area and I can imagine why. He is used heavily throughout the city and it must be worthwhile. The reason I am writing about this is that Hikonyan is not only cute but also has his own theme song. I was smitten by the song and it is annoyingly infectious. It is hard to get rid of and I have had trouble getting it out of my head since I first heard it. The video is below, but be warned that it may be stuck in your head and you may be singing “Hikonyan Hikonyan, Hikonyan nyan!” all day. This entry was posted in Culture, Kansai and tagged Cat, Hikone, Hikonyan, japan, kansai, Mascot, Naotaka, Naotaka Ii, Nyan by Dru. Bookmark the permalink. Utterly cute? Then it must be female, right? Cute female samurai thingie? PS: Damnit I knew I shouldn’t listen to that song. Now it’s infected me, too.